We’re excited to be attending our first HR Technology Conference and Exposition as an exhibitor this week at the Venetian, Las Vegas, NV. The show starts tomorrow! Mike Rowe will present the opening Keynote “Why Dirty Jobs Matter.” The fact is people who do dirty jobs are some of the happiest people you’ll ever meet — and they often are able to achieve a work-life symmetry others can’t. TV host and producer Mike Rowe, best known for his role on Discovery Channel’s Dirty Jobs, will give an illuminating account of the true nature of skilled labor, and why it’s being devalued by the media, advertising and even the government. With conviction, humor and deep humanity, he brings us face-to-face with Americans who are simply doing their jobs — happily and well. In the process, he will offer important lessons that can be learned from them about teamwork, determination, efficiency and our definition of success — and remind us of the enormous but forgotten benefits of hard, honest work, and how it affects everything from our national identity to our infrastructure and economy. Don’t forget to stop by our booth #236 to speak with Stop by to meet with iRecruit’s Brian Kelly . 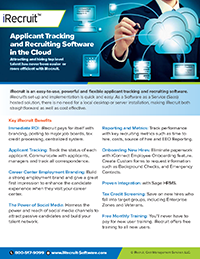 about iRecruit, Recruiting and Onboarding, or the Work Opportunity Tax Credit. This entry was posted in Blog, iRecruit Blog and tagged Brian Kelly, HR Technology Conference, keynote, las vegas, opening day. Bookmark the permalink.